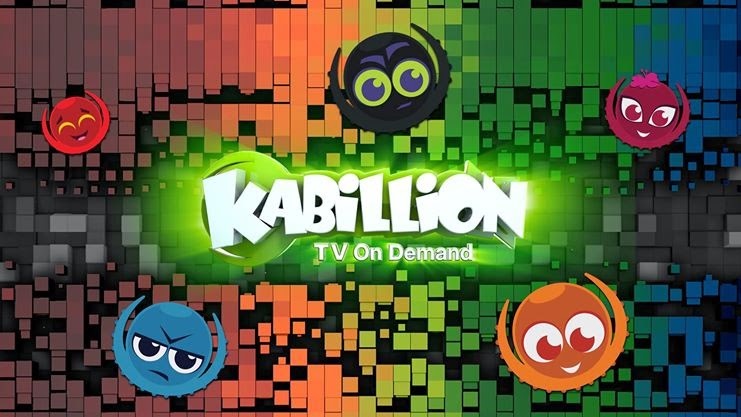 WOODLAND HILLS, CA – September 8, 2014 – Kabillion, the only independently owned company ranked among the U.S. Top 10 Kids Free On Demand TV Networks currently in over 45 million homes and owned by Splash Entertainment, announced today that the company is offering parents the opportunity to download and own episodes of their kid’s favorite Kabillion series for streaming on multiple devices. Chloe’s Closet, Dive Olly Dive and ToddWorld, all recipients of Parents’ Choice Awards, are the first three programs available for download at http://www.kabillion.com. Upcoming series include Wendy, Hero 108, Cosmic Quantum Ray, Mix Master and The DaVincibles. The series will be released on a weekly basis beginning September 8. The announcement was made by Nicolas Atlan, President, Kabillion. With 75% of today’s kids in the U.S. having access to some type of mobile device (eg. smartphone, tablet), Kabillion’s vast library of educational and informational series will be available for download at 4, 6 or 13 episodes at various prices. Instructions on how to download free coloring pages from the various series will also be posted on their website. Targeted to preschool children 3 to 5 years old, Chloe’s Closet and Dive Olly Dive have enjoyed international success with licensing, merchandising and DVD deals as well as a 3D feature film for Dive Olly Dive. Below is more information on each series. Chloe’s Closet - Follows the fun-filled adventures of an adorable, imaginative little girl named Chloe, who discovers magical new worlds while playing dress-up. Chloe’s exploits encourage the audience to celebrate how delightful it is to be a child embarking upon a fabulously fun and fearless, anything-can-happen journey. Dive Olly Dive – The series follows the fun-filled underwater escapades of Olly and Beth, two young, unmanned research submarines in training. Under the guidance of their human supervisor Diver Doug, they discover the marvels of the world they live in. ToddWorld – Based on Todd Parr’s acclaimed children’s books, ToddWorld is a celebration of imagination in a world where everyone is welcome. We received a bundle of Chloe's Closet to check out for ourselves. I love the adorableness of it all. It was so much cuteness. Chloe and her friends Danny, Riley, Mac, Tara, Jet, Lil, and Carys along with her toys; Lovely Carrot, Wizz and Soggy play dress up and go on magical adventures through her closet. Chloe sings a song and is transported to another location where she and her friends join whatever fun is going on over there. We also love Dive Olly Dive which is about a little submarine and his friend. They teach kids all about animals and places by taking them on different adventures. These shows are perfect for kids. As a mom I always search for kids that are age appropriate, interesting and fun. Now that my kids are older I still follow the same premise but when they were preschoolers they would have absolutely loved this channel. Enter the giveaway below and find out why Kabillion rules! Kabillion® and Kabillion Girls Rule™!, a subsidiary of US based Splash Entertainment, is a ranked Top Ten U.S. Kids Free On Demand TV Networks, reaching over 45 million US households and available on Comcast, Time Warner & Charter, among others. A network and marketing platform, Kabillion’s reach, with over 350 million views, extends across their multiple platforms, including Kabillion, Kabillion Girls Rule!, and the Kabillion YouTube channel which operates in direct partnership with YouTube. Specializing in children’s entertainment, Splash Entertainment is an innovator, developer, and producer of original animated television series, properties and brands that are implemented across all digital platforms of the media. The company’s library (500 half hours) contains content airing in more than 160 territories worldwide. Among Splash Entertainment’s key brands licensed in markets worldwide and produced by their talented animation production staff include: Chloe’s Closet®, Dive Olly Dive!, Hero:108®, Growing Up Creepie®, Pet® Alien and Todd World®. Splash Entertainment’s current new series production slate includes: two iconic Archie Comics brands, Sabrina Secrets of a Teenage Witch™ and It’s Archie™, Chloe’s Closet - Season 2, and Master Blaster™. As a production company hired by outside content owners, Splash Entertainment has produced animated series for a number of high profile brands, such as Care Bears™, Clifford The Big Red Dog, Lalaloopsy™, Strawberry Shortcake™, Bratz®, Zhu Zhu Pets® and He-Man Masters of the Universe. Duct Tape Mania would be fun! The little one would love Hide and Seek, Elmo! DreamWorks How to Train Your Dragon 2: Time to Race!